Did Luther really nail his 95 theses to the main door of the Wittenberg Castle church? Reformation historians are still discussing this point 500 years later. In fact, Luther himself never mentioned the theses. Belgian historical painter Ferdinand Pauwels didn't seem to care - he painted Luther with hammer and nails anyway. It unfortunately does not elaborate or provide sources. Did Luther really nail his 95 Theses to the church door on October 31st? And if not, where did that traditional image and date come from? 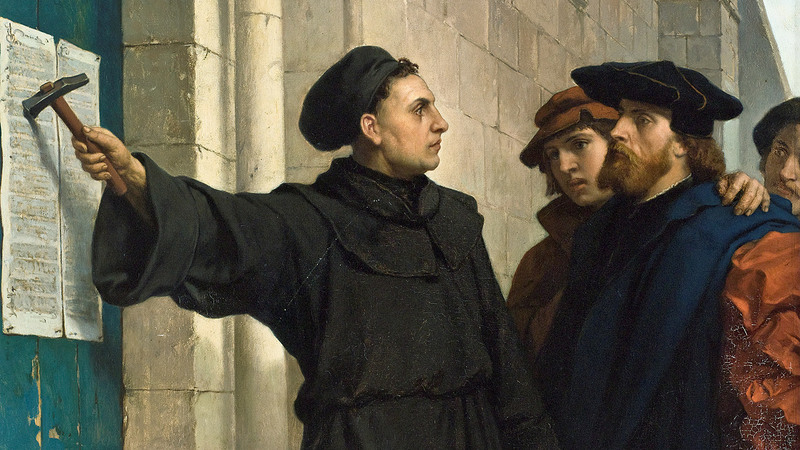 The Lutheran Quarterly has published several essays marking the 500th anniversary, one of which is Sources For and Against the Posting of the 95 Theses, by Volker Leppin and Timothy Wengert". Luther, burning for the study of godliness and outraged by Tetzel's ungodly and nefarious sermons, published propositions concerning indulgences, which are extant in the first volume of his works, and publically posted them at the church which is next to Wittenberg Castle on the eve of the feast of All Saints in the year 1517. It is clear Melanchthon regarded this as a significant and seminal event, worth commemorating, and that it happened on 31st October 1517. However, Melanchthon did not arrive in Wittenberg until August 1518 and so could not have been an eye witness or involved directly at the time. Nevertheless he was close to Luther, and collaborated very much with him, and so he might be expected to know. Separately there is a note by Georg Rorer, another close associate of Luther, who documented much of Luther's work, in the back of a book published some time after 1540, saying that on 31st October, 1517, the theses were published on the doors of the churches (note plurals). Thee is also a letter written in the late 1540s by Georg Major, who was a choirboy at the Castle Church in 1517, and went on to become a professor himself, saying that he was an eyewitness of the event. However, questions have been raised over whether the note really was by Rorer, and why the choirboy turned professor would have remembered such a relatively mundane event at all, since people pinning notices to the door was not unusual, and he could not then have known he was seeing a seminal moment in history which would so thrill future generations. It has been alleged he may have been influenced by Melanchthon's account. Even if Rorer's note was genuine he may simply have assumed that is what happened, since the Statutes of the University (1508) required that notice of academic disputations be given by fixing notices to the doors of all the churches in Wittenberg (although he could have asked Luther). Academic disputations, on a variety of subjects, were very much a part of university life, and proposing controversies for debate was not so much a privilege of a professor, as a duty. Whether he would personally attach them to doors or ask a university servant to do it is another matter. Until the mid-20th century Melanchthon's version was simply accepted. In 1959 historian Hans Volz suggested that the theses may have been sent only to a select group on October 31st and published somewhat later. Then the Roman Catholic historian Irwin Iserloh, pointed out that there is no record Luther ever mentioned posting the theses on the church door, and proposed the idea that Luther never did publish his theses on the door, but that this was a later misunderstanding by Melanchthon. Coming shortly before the 450th anniversary, this proved controversial. One issue here is whether Luther meant to start a formal local academic disputation, allowing others to write in if living at a distance, or whether he was, in fact, doing something different. Ordinarily an academic disputation should have been within a week and there is no record of any such disputation actually taking place. Luther, in a letter, said he had meant only to send them to a few for comment, in the context of explaining why he did not send a copy to someone in particular. This may indicate he had not intended, at that stage, to publish even in Wittenberg. Luther's reservations about indulgences were already known in Wittenberg. He had previously preached on them. At least as regards Tetzel, the Wittenberg authorities was united in regarding him as a grave threat. The Elector Frederick had accumulated a very large collection of relics and these were exhibited in the Castle Church, for a fee, twice a year. This was on All Saints Day and Low Monday (the 9th day of Easter). Venerating such a large number of relics at once was held to bring huge benefit in remitting any temporal penalties of sin remaining after repentance, confession and absolution. There were so many relics that it is said venerating them together was equivalent to doing penance for 1,902,202 years and 270 days. Frederick had invested a great deal of money in accumulating the relics, with the intention of providing a source of income for the university he had founded in Wittenberg. Wittenberg did very well from the twice yearly pilgrims who came to see the relics, and the locals understood the religious imperative to repent, confess and receive absolution prior to viewing them. The sale of indulgences was not allowed in the territory of the Elector Frederick. Nevertheless locals could nip across the border to buy them, returning to inform Luther and other local clergy they no longer needed to repent. Not only were Tetzel and his associates corrupting the locals, but pilgrims from elsewhere no longer needed to come to Wittenberg to see the relics. Why bother going to see the relics if one could buy full remission from Tetzel or his associates? Although Luther's reforms eventually led to the end of the exhibition of the relics in 1522, in 1517 it was Tetzel, not Luther, who was damaging the income stream from Wittenberg's exhibition of the relics. Anything against Tetzel, and the sale of indulgences, was exactly what the Wittenberg authorities wanted to hear. The date of October 31st was no random date. Whether Luther intended to publish his theses in Wittenberg, within weeks they had "gone viral", and were printed and circulated all over Germany, and even beyond. Many were concerned about the amount of money leaving Germany for Rome (and elsewhere), and only too keen to see a religious objection to the practice. Luther said he was surprised by the reaction. If Luther did personally attach the theses to the door it might not have seemed, in itself, of fundamental importance but merely fulfilling a university rule. The idea of the little monk bravely walking up to the door and posting his theses to the immediate condemnation of the entire church is a myth, but whether he did or did not fulfil the university regulation (if it applied to what he was about) is unknowable. When one sets aside emotion and the iconography connected with this debate, it becomes clear there are equally good arguments for and against the posting of the theses. It is a historically interesting but ultimately unresolvable question. Whether or mot the theses were posted, the Reformation loses none of its historic importance. 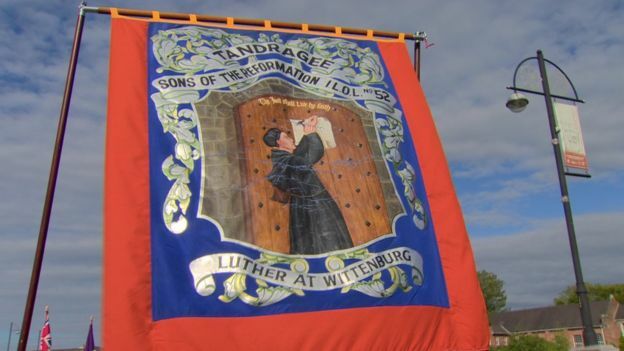 The nailing of the theses continues to be a popular theme, as on this UK banner. Martin Luther, we know from his own writings, was clearly neither a fanatic nor a protester. His sensible and restrained attitude to the Iconoclasts (see other question and answer) demonstrates this. 'Nailed' is somewhat evocative and very likely an exaggeration as is the 'door' of the building. What appears to be the case (see Wikipedia entry below) is that the porchway to the Castle Church was used to post notices of forthcoming events, just as is the porchway of Malvern Abbey, just down the road from me, today. The Ferdinand Pauwels painting (below) is not exactly dramatic and may well represent the reality of what occurred. Luther either pinned his letter to the Archbishop there, or (more probably) pinned a copy of his letter to the usual place for notices of interest, after having sent the original to its addressee. This is the version of events favoured by the current Wikipedia account of the event. Luther sent the Theses enclosed with a letter to Albert of Brandenburg, the Archbishop of Mainz, on 31 October 1517, a date now considered the start of the Reformation and commemorated annually as Reformation Day. Luther may have also posted the Theses on the door of All Saints' Church and other churches in Wittenberg in accordance with University custom on 31 October or in mid-November. The main portal was often used by the university staff to pin up messages and notices; it is generally believed that on 31 October 1517, the eve of All Saints' Day, Martin Luther posted his Ninety-five Theses on the doors of All Saints' Church. This act, meant to promote a disputation on the sale of indulgences, is commonly viewed to be a catalyst for the Protestant Reformation. Whether the event actually took place or not, however, cannot be conclusively established. Nevertheless, Luther sent his objections in a letter to Archbishop Albert of Mainz on the same day. In the heading of the letter, Luther makes it clear that his 95 theses (see below) will be 'defended' at his ordinary lectures at Wittenberg. It is therefore the notification of an event yet to take place, and therefore quite a justifiable document to pin up outside the Castle Church building, according to common practice. Luther, himself, claims to have behaved quite properly and in an orderly fashion, according to established procedures within Wittenberg. The Full Text of the 95 Theses - is available to read here. TL;DR We don't know but probably not. What we do know for certain is that on October 31, Luther posted a letter to the Archbishop of Mainz. This letter included the Disputation on Indulgences (95 Theses). This letter seems to say 'Sir, did you know this was happening? Let's talk about it.' much more than 'You guys are dead wrong. I'm out of here.'. Luther was trying to fix what he saw as a error in the way some people within the Church were acting. It is important to note that the Theses were not a Declaration of Independence or anything similar. At the time, Luther was a Catholic monk and a university professor. The theses do not object to indulgences in themselves. The 71st thesis seems to favor the concept. He did object to how they were being used, promoted, and sold. Luther felt that any reasonable person would agree with him if they just thought about it. Given this, the popular picture of Luther defiantly nailing the Theses to the Church door does not seem to fit. The details of the nailing of the 95 Theses to the door of All Saints in Wittenberg are disputed. Melanchthon places the event on October 31 and describes Luther as posting at All Saints alone. However, his account is later and not consistent with the standard practice of the day. The expected procedure would have been to have the Wittenberg University publish the dispute at all of the churches. Luther himself asserted that he followed the proper procedures and was not trying to ferment popular revolt. Modern historians tend towards the view of Luther nailing the Theses to the door as latter propaganda intended to give Luther the appearance of a prophet in the Old Testament Troubler of Israel sense. Probably not. I recently heard an Interview given by Andrew Pettegree, an expert in Europe specially during reformation. He stated that most of these thesis were more of University related research and were professionally printed. Further it might not have been stuck by him as he was a professor and had assistants, and Exhibiting such papers were quite normal during that time. So generally most of the thesis were regularly displayed in Churches and Universities. So, they were probably stuck one on the other and it would make sense to use Glue and not Nails. In the course of History, people have probably changed the event to using nails and hammering them just to represent their feelings with respect to reformation. Not the answer you're looking for? 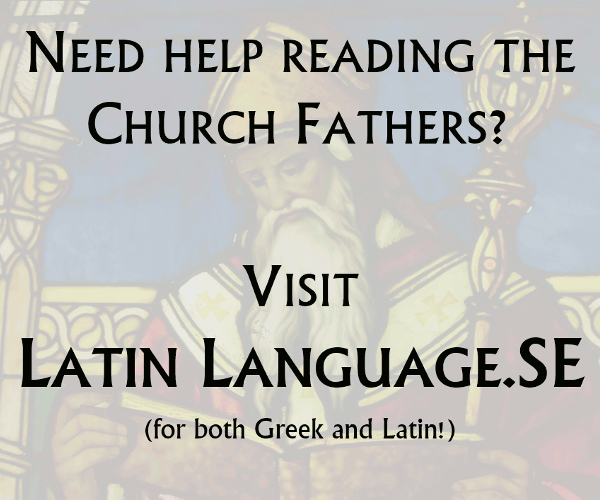 Browse other questions tagged church-history martin-luther or ask your own question. Why did Luther curse those who oppose indulgences? Did Martin Luther know Hebrew or Greek? Did Luther really use bar tunes for his hymns? Why did Martin Luther change his surname from ‘Luder’ to ‘Luther' very early in his career?